@stock1234 - was this post also intended for the "team" challenge thread? if yes, might want to post in there as well. just making sure. i know it's a little overwhelming keeping track of some of these threads in here lol. hence why i think i'll pull this league challenge aside until later on in the year. actually, what ima do is just "copy" your post to the team thread. that should do the trick. Hmm, so do you mean just posting the league form in the regular weekly contest threads so it gets everyone's attention there as well? I suppose I could try that. Maybe I also need to post the forms for the team challenge in the regular weekly contest threads as well since about half the participants did not use the Google Form to submit their picks for this week. Anyway, I will mull it over later this week and see how I feel about it. That being said, I still don't know what to do about situations like @snuffalchewy who has not been around to submit weekly picks for a couple of weeks now. So, I've had to use his past picks, and have just been repeating them for the past 2 weeks now. Just seems kind of pointless to me to continue doing that if a member isn't around to participate. Would rather prefer to run this in its entirety at a later date once we have the proper participation, which we kinda don't right now unfortunately. Thanks @rStock, I may just go ahead and do that then. To save myself some time here so I don't have to do these over the weekend, I'm going to post the following week's match-ups (form and spreadsheet links) right now and then just bump this post on Friday night or Saturday morning or whenever I update all of our other contest threads. Here are the Week #4 (Week of 2/11-2/15) match-ups. <-- click there to submit your weekly picks! <-- click there to view the spreadsheet! Here are the Week #3 results! And finally, here is a look at the standings after Week #3. Just a quick heads up to all! I'm not 100% sure how accurate the data is on the sheets today, so while I am updating these here it's very possible that what you're seeing is incorrect. I don't have an awful lot of free time to check on these. I'm just posting these in here and then off I go for the weekend. Please check these in your spare time and if you guys find any errors please report them in here. Hopefully this will get resolved soon! Just a quick reminder to all participants that the Week #4 Google Forms and spredsheet links have been posted on Post #49 here in case you guys are looking around for them! Hope you guys can all get a chance to submit the forms so I don't have to do them manually this week. 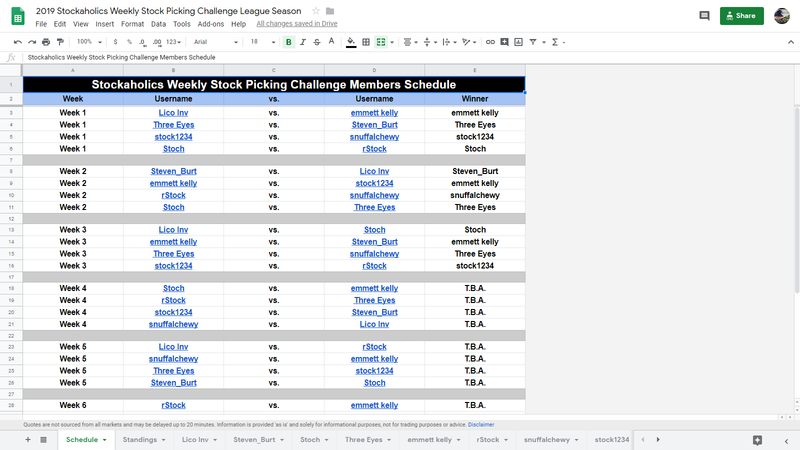 Would everyone in here be cool if I cut this league challenge to just 4 weeks instead of the 8 that I had originally intended (meaning this week would be our final week)? The workload in maintaining this contest format has become a bit more than I was hoping, mostly due to the fact that quite a few people are still not submitting picks via the Google Forms, even despite having posted the links on the regular weekly contest threads. I actually like running this format a lot, but admittedly it is becoming just a bit too cumbersome to manage when the forms aren't getting used from at least half the participants. I still would like to give this format another attempt at some point later on in the year...perhaps when we don't have so many other competitions actively running at the same time lol. For now though, I think this will be our last week with this. I'm surprised this even lasted as long as it did, even with the google forms having not getting used by half the members haha. Absolutely in favor of balance in all things: work vs recreation, family vs self, veggies vs desserts. And number of stock-picking challenges! Fully support narrowing to a number of challenges that works best for you and your time constraints! Well, I was going back and forth on this one all week long about whether I can extend this league challenge to a 5th week. But in the end, it looks like by all accounts that this will indeed be our final week with this. I really hate to cut this off right at the midway point of the season, especially to those of you who had been taking the time to submit your picks via the google forms (you guys all know who you are! and i can't thank y'all enough. ) But, truthfully half the other participants aren't using the forms to submit their picks which really does defeats the whole purpose of making this less time consuming on me lol. Anyway, I think it's cool that we still got to trial run this format for a month to see how it works, and I think I like it enough to want to give this another attempt (hopefully uninterrupted next time) at some point later on in the year. Many thanks again to all of you who helped me test run this for the past 4 weeks! You guys rock. I'll be posting up the final results of this league challenge either later this evening or tomorrow AM. Here are the final Week #4 results from the league challenge this week! And finally, here is a look at the final standings after this week. 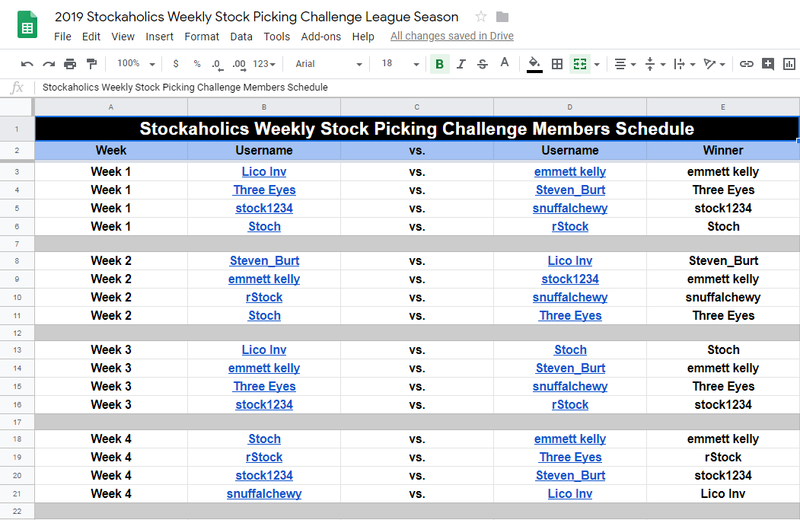 Congratulations to @emmett kelly our league challenge winner! If you guys would like to view the full league season spreadsheet click the button below! Again, I'll see if I can get another season going later on in the year when we don't have so many other competitions going on simultaneously. Lico Inv and Three Eyes like this.